This wheat berry salad with tomatoes and basil is a summer staple in our house. It is essentially bruschetta broken down into its most basic ingredients: tomatoes, basil, red onions, whole wheat berries, with a little olive oil, lemon juice and salt. Wheat berries are chewy, flavorful, and an excellent source of many nutrients and fiber. Because wheat berries are an intact whole grain, they are digested slowly and have a low glycemic index. That means that they won’t spike your blood sugar when you eat them (unlike refined grains) and you will stay full longer. Don’t be intimidated by the time it takes to cook the wheat berries. They can be cooked ahead of time and refrigerated until needed. You can also cook them in larger batches and freeze the wheat berries in salad-sized portions. This bruschetta wheat berry salad is a healthy and filling summer meal. It is delicious when made with just-cooked wheat berries, and also refreshing when prepared with pre-cooked, refrigerated wheat berries. And because this salad is dairy-free with ingredients that do not wilt quickly, it is a fantastic choice for serving at summer cookouts. A fresh and filling summer salad filled with chewy wheat berries, crisp red onion, and delicious tomatoes and basil. *Note: Tomatoes consistently test positive for pesticides in the USDA’s Pesticide Data Program, so I choose to purchase organically raised or pesticide free tomatoes. Read more on pesticides and produce. Thank you Natalie! This salad is one of my favorites to bring to cookouts and potlucks… such a refreshing change from a traditional pasta salad! I love using wheat berries in salads. They’re so good! Thanks Emily – I couldn’t agree more! I hope you enjoy this salad recipe! Wheat berries! I had never heard of them but they sound so good. And the fact that they are whole grains makes them all the more appealing. We eat so much processed food these days that real, whole food recipes are always welcome! 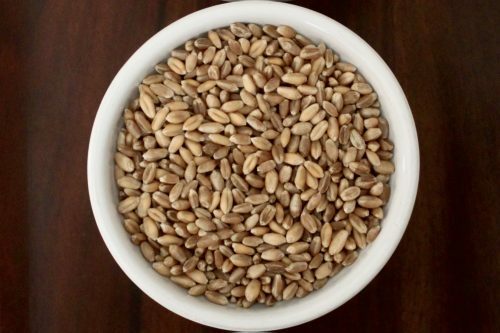 Saima – The nutty, chewy texture of wheat berries is just delicious! I hope you enjoy them in this summer salad! YUM! I love wheat berries! As a vegetarian, I’m all about the grains, haha. I can’t wait to try this! Thanks Liz! Wheat berries are definitely delicious… and so healthy too! I hope you enjoy this salad. I love that the elements in this salad are so bright and fresh. I have several of these things in my garden right now. Thanks Jenni! Nothing is yummier than freshly picked veggies… this salad is MOST delicious when made with still warm, just picked tomatoes! Wow, I never knew wheat berries even existed! Thanks for opening my eyes to a new food to try! Thanks Britt! Wheat berries are a favorite of mine… they are delicious when served hot or cold, like in this salad. They have such a wonderful, chewy texture. I hope you enjoy this salad!